~~Performance full aluminum radiator on sales for greeting 2019~ALTIS, BMW335, ROMEO156 , LEGACY & IMPREZA~~. Limited quantity, please contact us by e-mail for inquiry. Auto Advance Co., Ltd specializes in precision parts made by machining, stamping, milling with precise CNC facilities for automobile, electronic, aerospace industries with nearly 30- year experience. 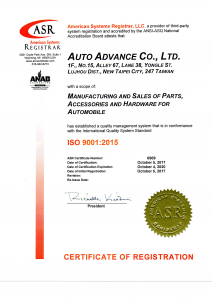 We are ISO 9001:2015 certified with a focus on manufacturing and sales of parts, accessories and hardware for automobile, motorcycle and bicycle. We are good at complex parts with tolerance within 0.1mm and have grown to provide production quantities of OEM partw with all types of materials including aluminum, steel, titanium alloy, stainless steel and copper using either our CNC lathes or our CNC mills. Under our expertise, we not only produce precisoin parts but also supply auto and motorcycle accessories. *Spacer, bearing, spring, aluminum plate, copper parts, most are custom parts. *DC power cord, 12V extension. *Coupler fitting for pneumatic tool, air piping, air pressure equipment. *Air blow gun for cleaning machinery and equipment. We provide one-stop services and prompt delivery to meet various demands from worldwide customers. Cost effective products with stable quality is our commitment for customers. You will be satisfied with our consistent quality, competitive price and best service.